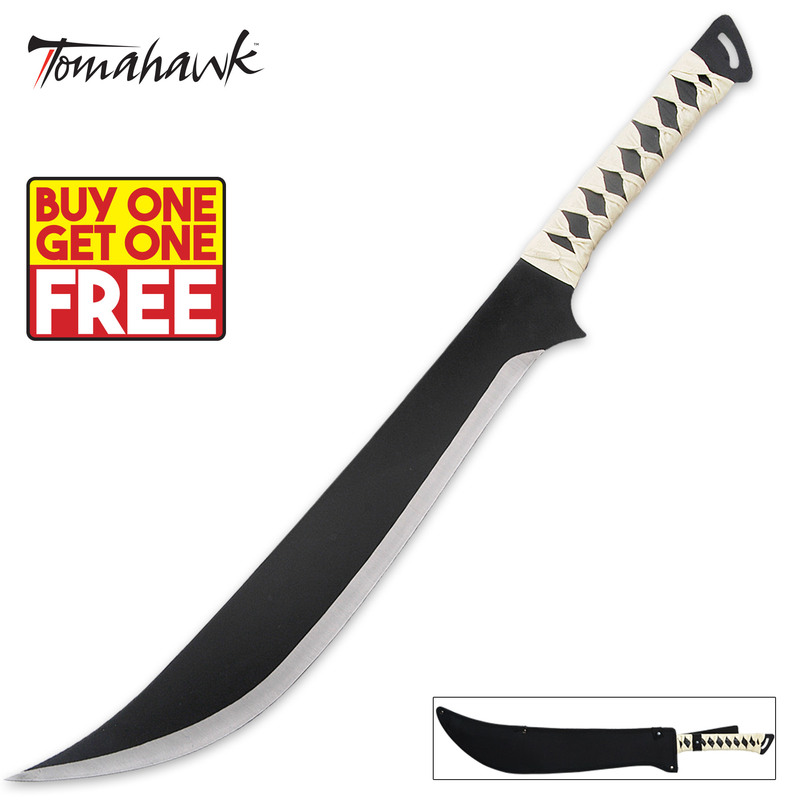 This fantasy sword features one-piece stainless steel construction with a black finish and delivers excellent chopping and slashing power! The scimitar-style blade measures 17 1/2" and offers superb balance. The handle features a black-and-white simulated leather wrap. This sword measures 27 1/2" overall in length and includes a heavy duty nylon sheath with snap fasteners. I love these swords! I got two of them as a BOGO deal and let me just say they feel GREAT in the hand. Sure, they're made of a thin stamped-out stainless (slightly less than 1/8" thick), but it makes them very nimble and quick. I wouldn't go whangin' it against tree limbs, but it's sharp enough for all of your water bottle and rolled-up tatami mat cutting needs! The blade has that nice thick belly curve which makes it an excellent chopper. You can't beat that price, especially if you get two for the price of one, so I highly recommend these! This sword is awesome! It's kinda thin, but super sharp. The handle's not so bad as is. I added a couple layers of electrical tape to make it better. Can't wait to mess stuff up in the back yard with this one. Plus I got this during a ten dollar Tuesday special which makes that much sweeter. Thanks BudK! Excellent product for an excellent price! Shipping to a little while but I chose the free one! Sturdy blade, comes sharp with a nice wrap on the handle! Got these blades today. Two swords for $20 not bad. Was surprised the swords had a decent edge on them. A little sharpening and they with be ready for some fun. I would not go to war with theses blades but they should make for some decent practice swords. these knives are strong and fast,l will tell all my friends about this swords!!!! !